has a broad portfolio of glazed roof solutions for all applications. Recent project briefs have included courtyard infills to listed buildings, atria roofs, opening glass roofs, walk on roofs and shaped large rooflights. Structurally glazed roofs can be supported in many ways to ensure your design intent is kept intact. These structural supporting methods can include designs such as glass beams, ornate steel sections or timber depending on the design brief. 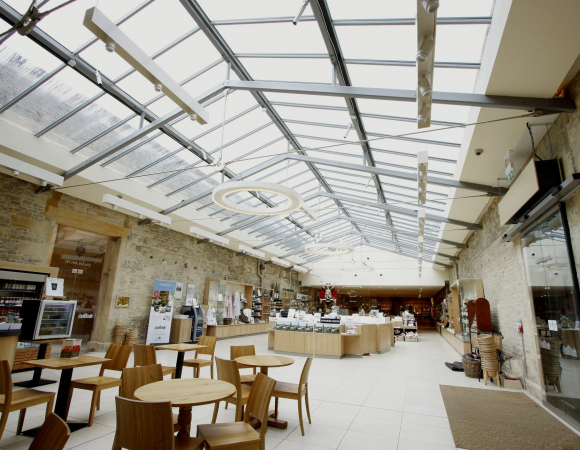 If you require an opening element to you glass roof IQ has a range of opening solutions that can be fitted into our structural glass roof designs for either venting, access or bringing the outside in. Sliding rooflights are also an alternative method to allow ventilation into the building while maintaining a minimal frame appearance. Many buildings in large cities are making more use of the space available on the roof and creating roof gardens or rooftop external spaces. Walk on rooflights enable light to flood into the internal living spaces while allowing the roof space to still be utilised. An automated opening glass roof from IQ is the perfect solution for these projects, we are happy to supply glass roof access products to any type or scale of project. t has been proven that natural daylight has many benefits and IQ offer a comprehensive range of roof glazing solutions to suit all shape and size of openings. Singular glass rooflights can be fixed, tilting or sliding. Flush glazed rooflights allow light to flood into the internal spaces with achieving a minimal frame appearance, this can be a subtle way of increasing glazing to buildings without making a huge impact on the layout and structure on the property. These rooflights can feature any of the technical glass products IQ offer. One highly popular option for roof glazing is ‘privacy glass’ that can be specified on the walk on rooflights for optional vision through the glass roof. The Sieger® thermally broken rooflight is also available from IQ to provide a thermally insulated glass unit with the option of a frameless aesthetic. The Sieger® thermally broken rooflight can be manufactured to impressive sizes to create an influx of natural light to the living space below. Alternatively ‘heated glass’ can be specified for rooflights over pool areas where it would be hard to take blown air services to. As part of our consultancy service, we can explore these additional glass options with you to ensure that you get the very best solution for your roof glazing. Our expert glass consultants are available to advise you on your glass roof specification. Contact us to arrange a personal consultation.